Cole Custer and Tyler Reddick lead them to the starting line. Custer selects the outside line. Green flag, Custer gets the jump. Reddick claws some ground back on the bottom lane. Side by side for the lead. Custer holds him off. Allgaier and more play bumper tag in the top 10. Christopher Bell tags the wall behind them. He washed through the marbles and made light contact behind them. Cole Custer is deep in lap traffic. Reddick is closing quickly. He’s there! Lap 26, Reddick takes them 3 wide around the top and moves to the lead! Custer falls to 3rd as Allgaier takes over 2nd. Lap 43, Justin Allgaier has caught the race leader. Ross Chastain tags the wall, Green is also collected. The caution is out. Green flag, they run side by side into turn one. Harrison Burton takes 3rd. Burton and Custer made contact and Burton made light contact with the wall, they all continue off turn four. Lap 60, Reddick leads Allgaier by a car length. The approach lap traffic. Lap 80, Allgaier has changed his line. He’s running a diamond with a late apex. Allgaier and Reddick when 3 wide through lap traffic! Reddick gets loose but he holds the lead! Final lap in stage 1, Allgaier is all over his rear bumper. Reddick is off the throttle. Allgaier moves to the lead! Justin Allgaier takes the win in stage 1 at Brisrol Motor Speedway! Reddick backed off early. I thought the stage was over. The scoreboard was 1 lap advanced from official timing and scoring. That might have caused the mistake. The field heads to the pit lane. Allgaier is first in and first off. Green flag on stage 2, Allgaier noses ahead into turn one. Bell is chasing the balance on his machine. Lap 120, Tyler Reddick has climbed to the rear bumper of the race leader. Allgaier opens the gap back up. 10 to go in stage 2, Bell has caught the bumper of Reddick. 6 to go, Jeremy Clements is around in front of the leaders. He clipped the apron and lost the rear. Single car spin but the caution is out. This stage will finish under the yellow. Justin Allgaier wins stage 2 at Bristol! The field returns to the pit lane. Justin Allgaier beats Christopher Bell to the pit exit line. Green flag on stage 3, Allgaier leads into turn one. Bell and Cindric run side by side for 2nd. Bell can’t get the power down on the bottom lane, move Cindric to 2nd. Lap 187, Bell is working the bottom lane once more. He’s nearly clear off te corner but he leaves the outside lane open. Cindric pulls even once again but Bell completes the pass on the bottom in the next corner. Move Bell to 2nd. 90 to go, Bell runs right on the bumper of Allgaier. Reddick is closing on them as well. Bell cuts to the bottom, he can’t make that work. Bell goes back to the top. 83 to go, Bell tries to slide Allgaier in turn one. He’s nearly clear but he has to lift, Allgaier drives back to the lead on the outside. Bell slides him again, he’s clear! Allgaier crosses under him. Allgaier is slow! Allgaier heads to the garage! He’s out of the race with mechanical issues. The race remains green. 41 to go, Harrison Burton is in the wall lightly. He has a flat tire and the caution is out. The leaders head to the pit lane. Bell is first in and first out, four tires for all. Bell will restart in 2nd as Brandon Jones stayed out on the race track. Green flag, Jones and Bell are even in turn one. Bell is trying to take the lead on the bottom. Bell bails from the bottom lane. He tries to drop in behind Jones on the top, he clips the left front nose of Custer at the flag stand. Bell makes light contact as he turns himself into the wall. All cars continue. 20 to go, Bell has climbed back to the bumper of Jones. He drops to the bottom once more in turn one, he’s nearly clear. Bell slides him in turn three. Jones crosses him on the exit and heads to the bottom back in turn one. Bell holds the lead on the top. 16 to go, Brandon Jones is in the wall with a flat tire. He heads to the pit lane under green. 11 to go, Custer and Reddick make contact for 2nd. Bell leads Reddick by a half second. Reddick tags the wall with his right rear but holds the 2nd position. Christopher Bell takes the win in the NASCAR Xfinity race at Bristol Motor Speedway! 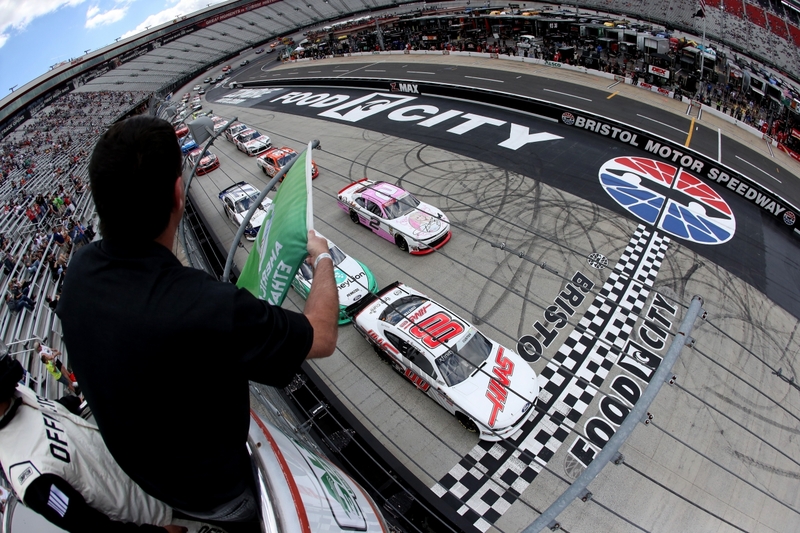 View full Bristol Xfinity race results below.